Agarwal has piled up 1064 runs in the ongoing Ranji season in just 6 matches. Karnataka opener Mayank Agarwal is going through a wonderful time in domestic cricket lately. The 26-year-old is leading the runs tally in the ongoing Ranji Trophy season with 1064 runs to his name in just 6 first-class matches. In fact, 1033 of those 1064 runs i.e. nearly 98% of runs have come in the month of November from four matches. 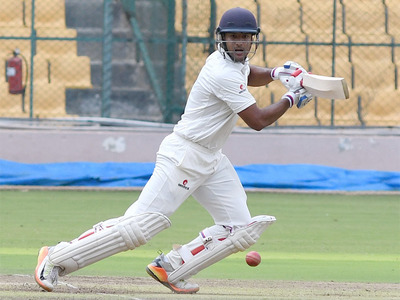 Playing in the fourth round of Ranji Trophy encounter against Maharashtra at MCA stadium Pune, Agarwal scored an unbeaten 304 off 494 balls as Karnataka thumped Maharashtra by an innings and 136 runs. Ever since the triple ton, Mayank hasn’t looked back and recorded the scores of 176, 23, 90, 133*, 173 and 134. Taking into account the success this season, Mayank termed it as 'a revelation' for him. He also revealed about the book that turned things around for him. Some seven summers ago the Bengaluru lad was gifted Joseph Murphy's book – ‘The power of the subconscious mind’ by Ramesh Mane, the Royal Challengers Bangalore team's masseur. At that point in time, Agarwal was just a teenager (19) and was also introduced to vipassana, a form of meditation. "The book got me thinking about my approach to life and vipassana helped me understand life better. It taught me that life is a journey and each one of us take a different path. I didn't change overnight, the process has been slow and the results have only come this season," Mayank was quoted as saying by Cricbuzz. "From where I was last season to where I am is a big difference, I've come a long way mentally. Last year I wasn't willing to accept the situation, I had scored 284 from seven matches (for an average of 23.66). I wasn't getting big runs (highest score 81). I felt I was fighting too much within myself. I changed that approach this season," he added. The alumni of Bishop Cotton Boys School, Mayank also disclosed that his mental development was complemented with skill-based training in the pre-season with his personal batting coach Rx Murali. "Skill and situation-based training helped me understand my game and mind better. It also helped me understand how I respond to different situations. We decided we were past the stage where we would think too much about technique. We focused on match-situation based training. We were going 700 -1000 balls every other day," said Mayank. "I'm not much of a numbers person. It feels good to have over 1000 runs against my name, but cricket is a team sport. Individual brilliance will not count for much, if it does not translate into team success. I didn't contribute much when we won the Ranji Trophy twice a few years ago, now I want to make my performance count for my team," he concluded.